Original Recordings Group release of Franz Waxman’s Academy Award winning music to the 1950 Billy Wilder film Sunset Boulevard. This is a 180 Gram audiophile virgin vinyl 45 RPM double LP release! Limited edition of only 2,500 copies. Release Date: April 19, 2013. 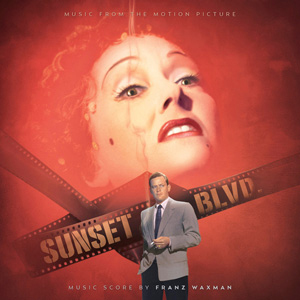 Waxman’s Sunset Boulevard score was ranked number 16 on the American Film Institutes list of greatest film scores and won him an Oscar. The score is fast paced and powerful. It uses various techniques designed to highlight the insanity of character Norma Desmond (played by Gloria Swanson), including low pulsing notes that were first heard in The Bride of Frankenstein. Charles Gerhard conducts the London Symphony Orchestra. Recorded by Kenneth Wilkinson at Kingsway Hall in London. issues on audiophile 45 RPM for the very first time. Numbered deluxe laminated gatefold jackets.